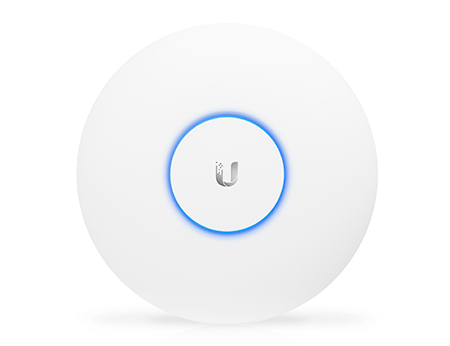 The Ubiquiti UniFi UAP AC Pro 5 Pack Access Point is Ubiquiti’s latest UAP which brings dual band connectivity at that low Ubiquiti price. Not only is dual band, now a feature on this new model, but the latest in 802.11ac technology is included by default along with a 3×3 3 dBI antenna configuration allowing up to 1300Mbps on the 5Ghz band. The UniFi UAP AC Pro simultaneously supports old gen’ and new gen’ wireless devices by offering dual-band operation with 3×3 MIMO technology for each band; from the legacy 2.4Ghz 802.11g/n to the new 802.11ac which provides greater speed for compatible devices. It has a range of up to 125 m (400 ft) and two matching Gigabit Ethernet ports. In the initial few months Ubiquiti are due to release firmware upgrades allowing zero hand-off and wireless uplinking across the AC devices, band B licensing is also expected allowing these devices to operate with more available frequencies and power output. With no license costs and a free software controller Ubiquiti offers unlimited scalability to build your wireless networks as small or large as you need. Start with one; expand to thousands. After the UniFi Controller software is installed on a Linux, Mac or Windows computer (or a seperate hardware box ) it can be accessed through any device using a standard web browser. The Ubiquiti UniFi Controller allows the administrator to instantly provision thousands of UniFi Access Points, map out networks, quickly manage system traffic, and further provision individual Ubiquiti UniFi devices.